The USS CANISTEO (AO-99), a Cimarron-class oiler, was commissioned on 3 DEC 1945. USS CANISTEO missed World War II serrvice by month, but "carried the goods" for the US Navy for over forty years. The first twenty years of her career was spent supporting the fleet was needed. Ranging from the East Coast of the United States, CANISTEO traveled the North Atlantic, North Sea, Mediterranean and Indian Ocean as ordered. In 1966 CANISTEO underwent the addition of a 60 foot section to her hull that added 30,000 barrels of cargo oil and 600 tons of cargo ammunition to her capacity. The "Jumboization" extended her capacity, range and useful service life. She went on to serve the Atlantic fleet for an additional twenty tree years in the same deployment cycles. USS CANISTEO served her country for 43 years, 9 months and 29 days, until decommissioned on 2 OCT 1989. CANISTEO was laid up at the NISMF at Fort Eustis, VA at first , then sold to UK ABLE fro scrapping in 2003. The hulk was not dismantled until 2008 due to environmental concerns. Canisteo (AO-99) was launched 6 July 1945 by Bethlehem-Sparrows Point Shipyard Inc. Sparrows Point Md. under a Maritime Commission contract; sponsored by Mrs. J. N. Chambers; and commissioned 3 December 1945 Lieutenant Commander E. L. Denton USNR in command. Canisteo cleared Norfolk 4 February 1946 for Melville R.I. where she loaded diesel oil for naval units taking part in the occupation of Germany. Returning from Bremerhaven and Farge Germany she carried out training operations in the Caribbean and then sailed to Iceland and Greenland returning to New York City 27 May. The tanker sailed south from Norfolk 27 November 1946 as a unit of Operation "Highjump " the largest Antarctic expedition to that time. Steaming through the Panama Canal to the Antarctic Canisteo reached Scott and Peter Islands and through her logistic support played a critical role in this historic exploratory and scientific project carrying on the Navy's traditional role in expanding man's frontiers. Canisteo returned to Norfolk 23 April 1947 after calling at Rio de Janeiro and Caribbean ports. Between 4 June 1947 and 23 October 1948 Canisteo served four tours of duty supporting the 6th Fleet by carrying oil from Bahrein to the Mediterranean. 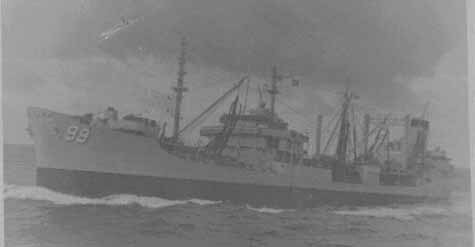 The winter and spring of 1948-1949 found Canisteo operating on fueling duty from Norfolk to Caribbean ports; Argentia Newfoundland; and Grondal Greenland. A pattern of alternating exercises in the Caribbean with overhauls and tours of duty in the Mediterranean in the following years was highlighted by her fueling in support of many fleet exercises. She played a part in augmenting the growing strength of the North Atlantic Treaty Organization through Operation "Mainbrace" (26 August-11 October 1952) and in combined operations with Canadian forces (16-20 September 1956). Active with the Fleet Canisteo continued to operate out of Norfolk through 1960 participating in fleet and NATO exercises.